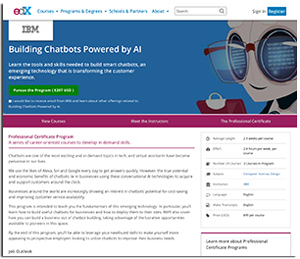 IBM is introducing two new Professional Certificate programs on the edX platform, focused on emerging tech in artificial intelligence: deep learning and chatbots. Each program offers a series of self-paced courses designed to build "critical, in-demand skills" for specific careers in the field, according to a news assignment. Applied Deep Learning Capstone Project. Programming Chatbots with Watson Services. Courses are taught by IBM's software developers, data scientists and other experts. Learners can take individual courses for free, or pay $99 per course to earn a Verified Certificate and pursue the full Professional Certificate program. "Accelerating pace of technology especially in the areas of AI, machine learning, deep learning and blockchain is proving particularly challenging for traditional education institutions. As a result, we see more students and industry professionals turning to online learning platforms like edX.org," commented Leon Katsnelson, CTO and director of the IBM Skills Network, in a statement. "We are delighted to partner with edX to offer IBM courses, hands-on labs and Professional Certificate programs to the edX community to develop and practice skills in these fast moving technologies."